You are in:Home » La memoria Biocultural. 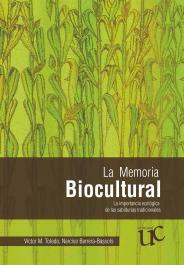 La importancia ecológica de las sabidurías tradicionales - The Bio-cultural memory. The ecological importance of traditional wisdoms. One of the central messages of this book is that overcoming the crisis of modern civilization will only be achieved with a paradigm shift. This means not only a radical change in values but also another vision of the world or worlds; of relations between men and nature; of relations between humans and nonhumans; and relations between human themselves. In contemporary Latin America alternative ways of looking at the future seem to draw on values, worldviews, practices and organizational forms of indigenous peoples, that not only manage to resist the onslaught of modernity based on principles of neo-liberalism, but also face and challenge both its material dimension, and the field of ideas, values and philosophical principles. The process of resistance, which goes beyond the modes that take the new progressive governments in the region, drives him to a time of recovery of collective memory, because as industrial modernity was accentuating went perfecting an 'instant world’, devoid of memories, an amnesiac society. In this regard, we are pleased to publish a new edition of The Bicultural Memory, edited from a university located in one of several regions of deep Colombia. The Cauca and neighboring South Pacific and perhaps make the region more ethno - ecological resistance of Colombia with a strong territorial, local and regional organization. Victor M. Toledo, is a researcher and professor at the National Autonomous University of Mexico. For four decades he dedicated to the study of relationships between indigenous cultures and the natural environment (ethno-ecology), its value to the design of new production models food (agro) and its importance for cultural resistance and self-managed rural projects (political ecology). Author or editor of nearly twenty books and more than two hundred scientific, journalistic articles and outreach, has advised several processes sustainability and indigenous regions of Mexico and Latin America. Narciso Barrera – Bassols is a Mexican geographer and anthropologist who studies the beliefs and indigenous knowledge and farming practices concerning nature for over three decades. He has conducted fieldwork in various communities and Mesoamerican peoples, Andean, Andalusia in southern Africa. Work issues of environmental history, rural landscapes, agro-ecology, ethno-ecology and Ethno-pedology. He has published one hundred articles, books and chapters in both scientific and popular international books. He works as an advisor for indigenous and farmer organizations in Mexico and as a guest professor at universities in Colombia, Brazil and Spain. Currently coordinating an academic program on human development for sustainability at the Autonomous University of Queretaro, Mexico, and develops projects on environmental conflict in the country.